In the first post of this series, I talked about Majayjay Falls. Now, let us go to another good place to cool down this Summer. This place is none other than Tagaytay City. Once you are in this city, I assure you that you will feel cool because of its cool climate. There are times that fogs form in Tagaytay City even if it is afternoon. One thing that is getting popular in Tagaytay City is the Tagaytay Zipline, which can be found in Picnic Grove. Tagaytay Zipline is an exciting activity inside Picnic Grove and many visitors are trying it. Tagaytay Zipline is exciting because its cables cross the chasm between the two high places in Picnic Grove. Once you try the Tagaytay Zipline, you will feel the cold air rushing in your face. Also, you will see the the world-famous Taal Volcano while you are rushing down to the other side. Somebody is enjoying the Tagaytay Zipline. Tagaytay Zipline is available everyday. One-way trip across Tagaytay Zipline costs 200 pesos during weekdays and 300 pesos during weekends and holidays. Two way trip costs 300 pesos during weekdays and 400 pesos during weekend and holidays. If you don't have the guts to try the Tagaytay Zipline like the person on the above photo, then you can still try Tagaytay Zipline by riding the cable car, which looks like a big bird cage. One-way trip along Tagaytay Zipline costs 200 pesos during weekdays and 300 pesos during weekends and holidays. Two-way trip along Tagaytay Zipine costs 300 pesos during weekdays and 400 pesos during weekends and holidays. Expect long lines to Tagaytay Zipline during holidays and weekends because too many visitors want to try Tagaytay Zipline. 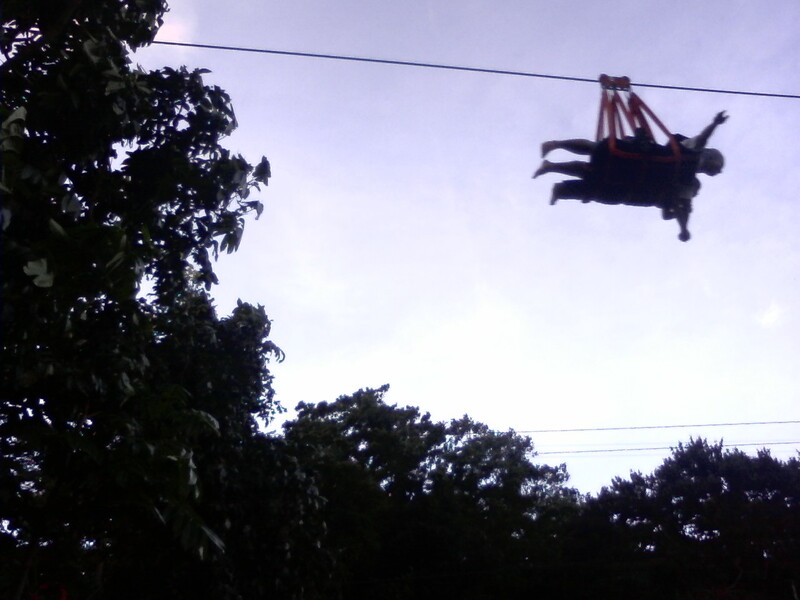 Tagaytay Zipline in Picnic Grove is one of the best ways to cool yourself down this summer. Read my other post about Picnic Grove. Visit Before the Eastern Sunset and read about my visit to UP Marine Science Institute in UP Diliman. Maganda talaga ito Supergulaman. Kaso hindi ko pa nasusubukan. Medyo nainip lang kami kakahintay marelease ng souvenir items namin sa zipline. Buti pa kayo. Ako hindi ko pa talaga nasubukan yang Tagaytay zipline. Gaano kayo katagal naghintay? Mga isang oras din? At saka ano ang inyong souvenir items?